Although credit card and bank transfers are increasingly more common for small transactions, secured money orders are still one of the safest ways to transfer money between individuals and businesses. The United States Post Office has been offering money orders for years, but stiff competition from other services has made them a less popular option. However, USPS money orders may still be the best transfer method for customers wanting a safe and guaranteed money transfer. The first and most immediate benefit to buying money orders with the post office is that they allow you to purchase domestic money orders of up to $1,000. Many grocery stores and other transfer facilities will only sell money orders of up to $500 at a time. Stores like Publix in the southeastern United States place a $500 limit on money order purchases to reduce the risk to the business from bounced checks, faulty credit cards, or other bad payments. USPS also offers international money orders up to $700 for an additional fee. 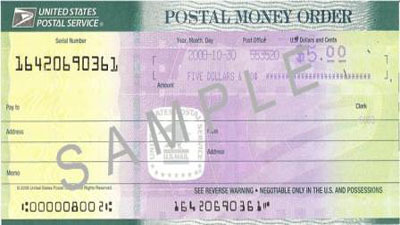 All United States Postal Service money orders come with 3 distinct security features to prevent fraud and scams from taking advantage of consumers. Official USPS issued money orders will have a watermark of Benjamin Franklin in the bottom left corner of page. To see the watermark, hold the money order up to a direct light source and look for Franklin’s face. In newer money orders, the face repeats multiple times in a line down the entire left side of the paper. Second, there’s a multicolored band that threads through the money order paper on the right side of the page. The way the band is threaded through the paper makes it difficult to forge. Finally, the paper and ink used to print the dollar amount on the money order will easily smudge if they’ve been tampered with. This security measure makes it easy for banks or individuals trying to cash the money order to see that the money order has been tampered with and that the dollar amount may have been changed. If a bank or cashing location suspects that the dollar amount has been altered, they will refuse to cash the money order and will suggest that you call the customer service hotline to request a newly printed money order with the same serial number. While companies like Western Union have similar security features in their money orders, previous employees of the company have reported that it’s very easy to wash the ink away from the orders and only a trained eye can pick up on forged papers. As a result, many con artists don’t try to forge USPS money orders because of their tougher security features. The USPS makes it easy to replace lost or damaged money orders. If you visit your local post office, or go to the official USPS money order website, you can print and complete a PS Form 6401 Money Order Inquiry. Once the form has been submitted, you’ll then be asked to look in a list for the serial number of your money order. If you keep the receipt from your money order purchase, you can use the receipt number to track your money order’s serial number. If you’re unable to find the serial number, the USPS makes it easy to call the Postal Inspection Service hotline at 1-877-876-2455. The customer service representative will then help you find your missing money order and replace it with a new one, with much less hassle than you’d get dealing with independent franchises like Western Union or money orders purchased in grocery stores. The grocery store may seem like a more convenient place to buy your money orders, but for all these reasons, you might find that it’s worth your while to head to the local post office and buy your next money order there.